Isolated pulsars gradually slow their spins, but the opposite happens if the pulsar is joined by a companion star as part of a binary system. Gas accreted from the star can force the pulsar to spin faster, resulting in rotation periods of just a few milliseconds. Credit: NASA/Dana Berry. Astronomers at the University of California, Santa Cruz, have developed a new technique to determine the ages of millisecond pulsars, the fastest-spinning stars in the universe. The standard method for estimating pulsar ages is known to yield unreliable results, especially for the fast-spinning millisecond pulsars, said BÃ¼lent Kiziltan, a graduate student in astronomy and astrophysics at UCSC. "An accurate determination of pulsar ages is of fundamental importance, because it has ramifications for understanding the formation and evolution of pulsars, the physics of neutron stars, and other areas," he said. 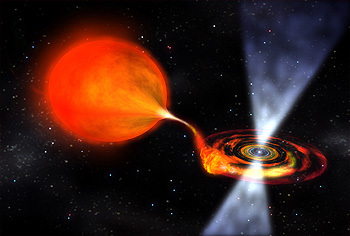 Kiziltan has been working with Stephen Thorsett, professor of astronomy and astrophysics at UCSC, to study the evolution of millisecond pulsars. He will present their new findings at the American Astronomical Society meeting in Pasadena on Monday, June 8. A pulsar is a rapidly rotating neutron star, the collapsed core that remains after a massive star explodes as a supernova. The pulsar emits beams of radio waves (as well as x-rays and gamma-rays) from the magnetic poles of the neutron star. Because the magnetic poles are not aligned with the star's spin axis, the beams sweep around like a lighthouse beacon, sending pulses of radio waves toward observers on Earth. The period between each pulse of radio waves corresponds to the rotation rate of the neutron star. "In most cases, the only information we have is the radio pulse we receive from these compact stars. From these pulses we are trying to determine the ages, masses, and orbital parameters--a very challenging task indeed," Kiziltan said. Ordinary pulsars tend to rotate a few times per second, and they gradually slow down with age, eventually becoming too faint to detect. Millisecond pulsars, however, rotate hundreds of time per second. They achieve these extraordinary spin rates by pulling in material from a binary companion star, a process that transfers angular momentum from the companion to the pulsar. "This spin-up process is essentially like giving CPR to a dead or dying pulsar, giving it a second lease on life," Kiziltan said. The standard approach to determine the "characteristic" or "spin-down" age of a pulsar is based on two parameters: the period between pulses and the rate at which they slow down. Kiziltan and Thorsett showed that this method may over- or under-estimate the age of a pulsar by a factor of 10 when applied to millisecond pulsars. To improve the accuracy of the standard technique, they incorporated additional constraints that arise from the spin-up process and physical limits on the maximum spin period. "We modified the age calculations to be consistent with these constraints and showed that this approach can achieve estimates closer to the true age of the pulsar," Kiziltan said. They show that, in some cases, millisecond pulsars that appear to be young can, in fact, be several billion years older. In other cases, young millisecond pulsars may mimic the characteristics of pulsars that are as old as the galaxy itself. A paper describing the new findings will be submitted to the Astrophysical Journal. This research was supported by the National Science Foundation. Note to reporters: You may contact Kiziltan at bulent@ucolick.org.